Trim roots and stems from beets, then drizzle 1 tablespoon olive oil over the beets. Sprinkle with salt and bake in preheated oven for 1 hour or until tender. Cool; peel beets and cut into bite sized pieces. Combine the remaining olive oil, mustard and balsamic vinegar in a bowl with a whisk. 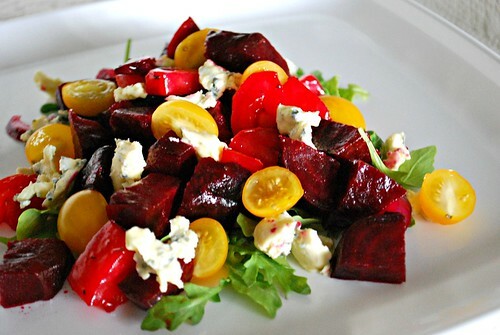 In a large bowl, combine the beets and tomatoes with a couple tablespoons of dressing; toss to coat. Transfer mixture over the bed of arugula. I thought that was a bouquet! That looks so gorgeous and yummy! We love beets in salad! In fact, I just had a salad with beets on Saturday night! Ӏ'm veгy pleasеd to discover thіs great site. ӏ want to too thnk you for ʏour time just for this fantastic read!! as a favorite to loοk at new information οon your blog.